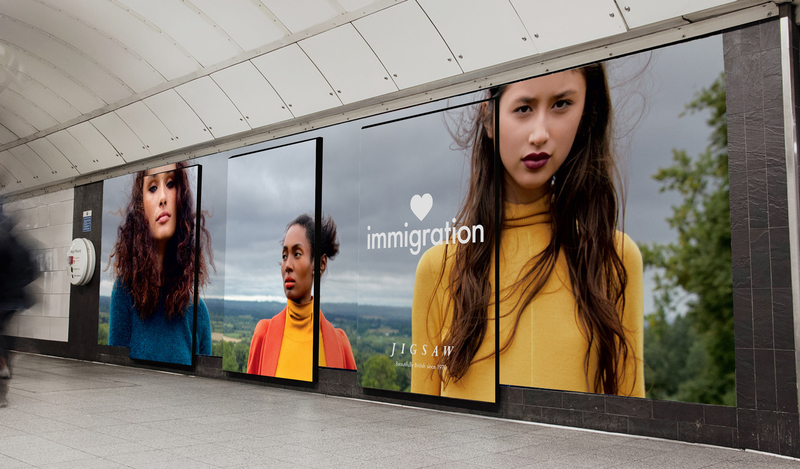 Those calling for brands and CEOs to become more activist in recent times will have been delighted to find themselves in Oxford Street tube station last week surrounded by Jigsaw’s bold new campaign celebrating immigration and diversity in British life. Admitting they didn’t particularly research it and the campaign was largely built on instinct, Jigsaw clearly have a very good sense of who they’re talking to. And with CEO Peter Ruis explaining how the campaign was born out of a concern for a loss of important British values as a result of the political turmoil of the past couple of years, you get a sense of this being very personal – a dual-passported CEO standing up for the 30% of its workforce who don’t have UK passports, as well what the company believes in. They can also be so bold because it comes from the top, in a business which is privately owned and so less concerned about treading carefully around different stakeholder groups. It’s not surprising that it has been largely well received by a metropolitan audience which has grown up with this most British of aspirational high street brands and seems to share its values. A place whose strapline is Beautifully British since 1970. But the purposeful cynic in me was also wondering how deep this sense of social responsibility ran, especially in an industry where diversity of people and product has often been equated with poorly paid workers producing fast fashion in less-than-ideal conditions. While it can read a little like a checklist in places, the Jigsaw website has some clear and detailed commitments to sourcing and working conditions and refers to a set of values called Style and Truth. There’s even a refreshingly honest Pricing Manifesto which feels a different approach from the fast fashion brigade (as long as you can afford it). Yet I found myself wanting to know more: more about the supply chain of 80 companies across 14 countries, more about what Style and Truth means in practice and more about what lies behind the campaign and the people it celebrates. Bold though the campaign is, it’s also referred to as its AW17 campaign, giving it a slightly temporary feel; the main call to action is to read the manifesto and “Shop the Campaign” rather than perhaps find out more, sign up to something, get involved or link to an NGO partnership that promotes its aims. Now I’m a Jigsaw fan and I like the campaign. It has passion, optimism and leadership and, as part of a dual-passport household, I can only agree with its sentiment. But equally I hope it’s just the start of something, and there are signs it is. Those organisations that provide real leadership in brand and corporate responsibility are those where the commitment to social impact sits at the very heart of the business and Jigsaw is quick to point out that this latest campaign fits directly into its core values. It has previously run campaigns reminding us clothing is “For life, not landfill” as well as being among retailers who have shunned Black Friday discounts. Among the fashion, its blog also covers issues such as ageing and mental health. There’s the opportunity here for Jigsaw to evolve the campaign into something which outlasts the season and truly defines the business. The challenge will be to tie its various socially-focused campaigns into a simple, coherent, clearly-articulated position which is more than a series of discrete actions from an ‘activist brand’. And, of course, is based on genuine change which it is helping to bring about. Patagonia sets the standard here with its environmental mission. It runs campaigns, supports its employees in getting involved in them and its Footprint Chronicles tell you everything you need to know about the product you’re thinking of buying, who made it and how they made it. It has driven change in its business to reduce environmental harm. It also sells a lot of warm clothing. There’s a definite gap in the high street for an aspirational brand like Jigsaw to make a similar social impact with a customer base that, it instinctively seems to know, will applaud them for it.